Video Game Censorship in New York City? Have you ever been to a PG-13 rated Website? Well, you could, if British Secretary of State for Culture, Media, and Sports Andy Burnham's plan follows through. In an interview with the British newspaper The Daily Telegraph, Burnham said that "cinema-style ratings" should be given to Websites to grade them based on content and decency. And while I would agree with his assessment that the Internet can be "quite a dangerous place," I just don't see a movie-style rating system as a viable solution. The biggest problem is that in order for the ratings to work, parents need to get involved. Does anyone actually think that the "you must be 18 years of age or older" warnings that open on pornographic Websites stop eager teens from getting inside? No -- so why would any rating system work on other Websites without supervision? And since it is impossible to actually verify the age of the person on the computer from the Website itself, that supervision needs to come from someone at home with the child, such as a parent. 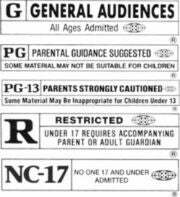 The problem with that, though, is that I doubt parents will get involved, or at least not any more than they already are, if a movie-style rating system is in place. For a few years I worked in a videogame store. I learned during my time in retail that parents do not pay attention to the ratings of what their children want. Parents of 8-year-olds would ask to buy M-rated games, the equivalent of an R-rating, and then be shocked when I would tell them that a game called Hitman involved assassinations with piano wire, or appalled that a game called Grand Theft Auto was about being a criminal (along with other content that parents find objectionable). Not only did these games tell the parents in the game title why they were rated M, but the game box pictured some of the objectionable content in question and gave a full description why it isn't suitable for people under the age of 17. But no parents ever looked at the rating, or the box, or even the game's title, and would ask to buy it for their 8-year-old. I don't see ratings for Web sites faring any better if parents don't start taking responsibility for their children and paying attention to what their kids are watching and doing online. I know it is not popular to blame the parents, but it's the truth. Any parents who are not already monitoring what their kids do on the Internet will not do anything differently just because a rating system is in place. A more reasonable strategy for making the Web safer for minors would be to educate parents how to better monitor their children's Web usage, because ratings do not mean anything if the parents are not making the effort to check the ratings.